This shrub was found growing in partial shade along a canyon near Rio Rico, Sta. Cruz Co., Arizona, USA. 11 July 2009. LEAVES: The compound leaves are 2 to 6 cm long and twice divided into very small segments. 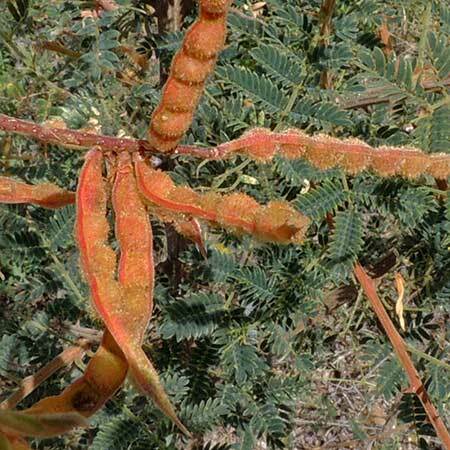 At night or when the plant is heavily disturbed the leaflets fold up. RANGE: In Arizona this attractive shrub is restricted to the canyons and mountain slopes of the Sky Island Mountains in the southeast. Ranges into New Mexico and western Texas mountains. Also found in northern Mexico. SHRUB: A woody shrub with thorny branches mostly less than two meters tall. 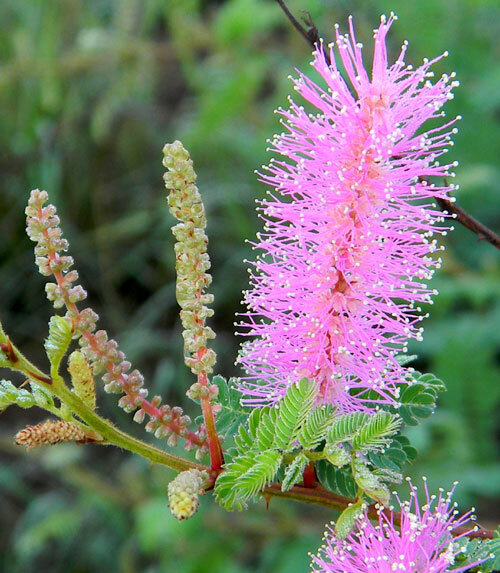 FLOWERS: The spikes of numerous small flowers are very showy owing to the bright pink stamens which are long exserted. FRUIT: Several seeds inside a flattened bean pod. The pods as they are developing are coated with velvety hairs and are the basis for the common name. There may be some prickles along one side of the pod. ARMED: A pair of sharp, curved thorns are set at each stem node, like cat's claws.